A trip to the Land of the Thunder Dragon reveals stunning scenery in the Himalayan valleys, history lessons on the influence of Guru Rinpoche, and insight into a Buddhist nation whose guiding ethos is that of Gross National Happiness. The introduction of Buddhism occurred in the seventh century A.D.
A trip to the Land of the Thunder Dragon reveals stunning scenery in the Himalayan valleys, history lessons on the influence of Guru Rinpoche, and insight into a Buddhist nation whose guiding ethos is that of Gross National Happiness. 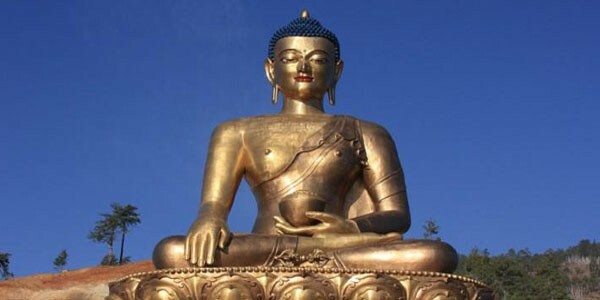 The introduction of Buddhism occurred in the seventh century A.D. The legend has it, when the Tibetan King Songtsen Gampo, was ordered by Guru Rinpoche to build 108 eight temples all across the Himalayas in order to subdue a demons and to overcome to build Lhasa Samye in Tibet. Of the 108 temples, two of the temples are in Bhutan, one in Paro and the other in Bumthang. It is believed to have been built on the left feet of the demon in Paro and left knee of the demon in Bumthang around 637A.D. These twin temples are the oldest temples in Bhutan and thus the arrival of Buddhism in Bhutan. Many Buddhist missionaries from Tibet and India over the many past centuries left their lasting legacies in the form of living temples, monasteries and Dzongs. State clergy is the one that practiceDrukpa Kagyu School of Tibetan Buddhism and the monks from private owned monasteries practice the oldest Buddhism of Nyingma tradition. In essence they are the same but the difference is in its founders. Our suggested pilgrimage itineraries will take you following the footsteps of those founders for in-depth understandings and liberating insights for intellectual enlightenment at the end of these sacred tours for yourselves. Our pilgrimage package includes 13-night 14 days tour that will cover most of the footsteps of Guru Rinpoche and other saints of Buddhism.